UHD1 - Timeline Television Ltd.
Timeline Television has designed and built the first purpose built Ultra HD 4K (UHD1) outside broadcast unit in Europe. In conjunction with BT Sport this represents a significant investment in this brand new technology. 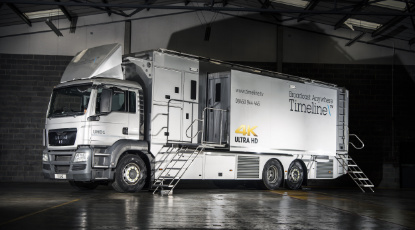 UHD1 launched in August 2015 and is available for hire for both sporting events and other production genres such as the arts, entertainment and natural history. This cutting edge Outside Broadcast unit, built by Timeline’s System Integration division, is designed from the ground up to deliver Ultra HD 4K programs to the same high standard as current HD programs for complex live or as live production.